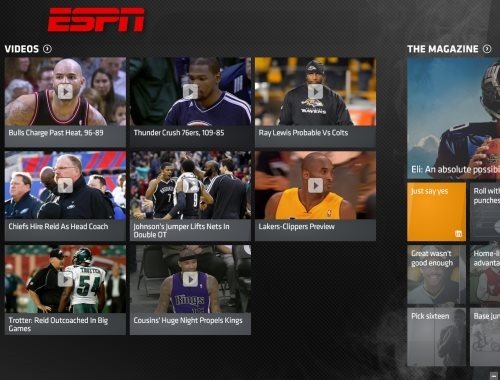 Here are 3 free Windows 8 ESPN apps designed for all sports fans. These ESPN Windows 8 apps provide you comprehensive coverage on Sports. Here, you can get complete Sports info including MLB, NFL, NBA, NHL, Basketball, Football, NASCAR, Soccer, and more. The ESPN App is a free Windows 8 ESNP app that facilitates you with all the sports related things such as sports videos, sports magazine, sports related photos, just everything that you would expect from an advanced sports website. You can get up-to-minute scores, and updated sports News, right on your Windows 8 screen. You can also watch videos of various matches, read magazines, pin to start your favorite magazine, video, or anything. In addition, you can also signin to your ESPN account in this app. It’s actually sync you account with the app, thereby allowing you to see latest scores, analysis of your favorite players, leagues, teams, watch updated in-depth sports coverage, listen to ESPN podcasts such as Mike and Mike, The BS Report with Bill Simmons, PTI with Michael Wilbon and Tony Kornheiser… and much more. You can also share video highlights and news with others, from within the app. Go ahead and download The ESPN App in Windows 8 now. ESPN Cricinfo is another ESPN Windows 8 app that focuses just on cricket and info related to Cricket. It comes with comprehensive coverage on Cricket, covering the world. If you are a die-hard cricket fan and want to follow cricket then this ESPN Cricinfo is for you. You can get live scores updated news, up-to-minute headlines, features, just everything that you would expect from an advanced cricket news website. 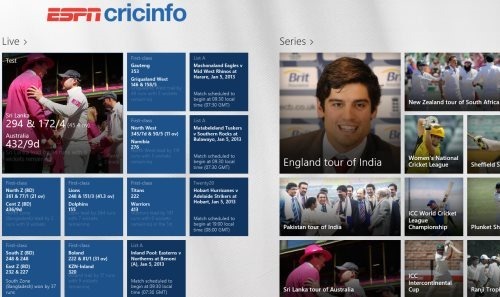 This Windows 8 ESPN app keeps you updated with live scores, live match reports, previews, along with a ‘Features’ section that provides in-depth analysis, opinion, profiles, tributes, and more from ESPN Cricinfo’s Global Team of Writers. Go head and download ESPN Cricinfo app in Windows 8 now. Provides the worldwide Football coverage, this ESPN app for Windows 8 is meant only for Football fans and those who follow Football 24×7. ESPN FC facilitates Football fans comprehensive coverage on Football including the live scores, player profiles, results, tables, fixtures, club-profiles, just everything. In addition, this Windows 8 ESPN app lets you watch all updated Football videos, see worldwide Football tournament and much more. You can also add team and build up the ‘My Team’ section where you can follow results and latest news of your favorite team or club. 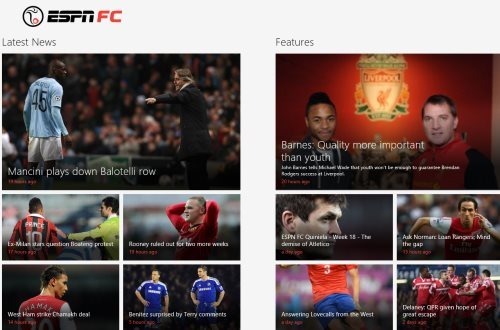 Go ahead and download ESPN FC app in Windows 8 now.